boasts of a fingerprint sensor and a non-removable long lasting battery of 4000 mAh. See the full list of its features below. 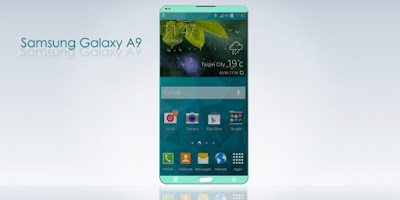 Samsung A9 has an all Aluminium cover, 7.4 millimeters thick and a slightly curved 2.5D glass screen with an AMOLED full HD display screen of 1080 by 1920 pixels. And not to forget, the A9 has a 6-inch screen with finger sensor capability. It has a 13 Megapixel back camera with OIS (Optical Image Stabilization) for extra cool pictures and a front facing camera of 8 Megapixels for video calls and cool slamming selfies. It has a storage capacity of 32 GB which is expandable to 128GB using microSD. The A9 has a 3GB RAM for optimum performance.